We found this tasty side dish recipe at Just Vegetable Recipes. It was already vegan, so no adaptations were necessary. We baked the beets first. Once they had cooled enough to handle, we sliced them and then cut the the slices with a snowflake cookie cutter to make a special treat for the holidays. That could even be a fun task for kids to do. We used fresh cranberry sauce as an added garnish, although that was not so needed. I would also suggest a pinch of salt to the sauce. This makes a very nice side dish, no matter what time of the year. 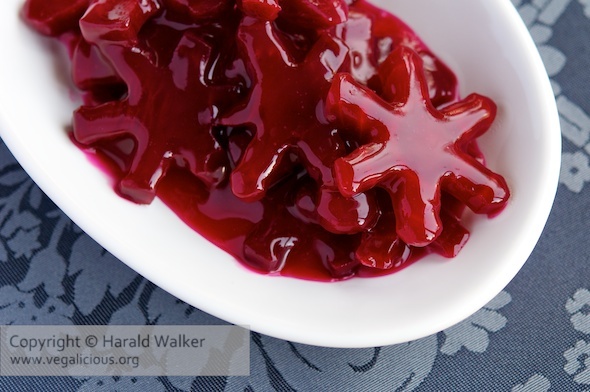 Posted by Chris Walker on December 9, 2011 in Beet, Cranberry, Reviews.